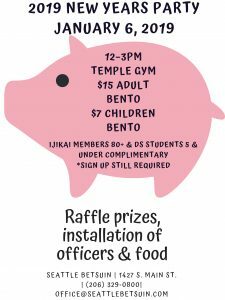 The Seattle Betsuin’s annual New Year’s party will be held on January 6th in the temple gym from 12-3 PM! Come out for delicious food, raffle prizes and the installation of our new officers. Bento prices are listed below. Please note that if you qualify for a complimentary bento you still need to sign up for one! Special Bodhi Day Service and Temple Potluck on December 2nd!